The earliest depiction of Henry VIII's "lost" palace in Surrey could leave the UK unless a buyer comes forward. 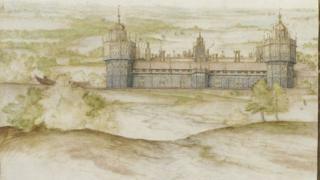 Nonsuch Palace was painted by the Flemish artist Joris Hoefnagel in 1568. Culture Minister Ed Vaizey has placed a temporary export bar on the watercolour in the hope a UK buyer can match the asking price of £1m. "We have very few paintings of the palace so I really hope we can find a buyer to keep this masterpiece here in Britain," he said. The piece is the oldest of six remaining depictions of the palace, considered to be one of the Renaissance period's most stunning buildings. It was intended to rival the opulent residences of French king Francis I. In 1670 Charles II gave the palace to his mistress, Barbara Villiers, who began to dismantle and sell parts of the building to pay off gambling debts. By 1690 the building had all but disappeared. The painting went for auction in 2010 but failed to meet its reserve price of £1.2m. The decision to defer the export licence follows a recommendation by the Reviewing Committee on the Export of Works of Art and Objects of Cultural Interest (RCEWA), administered by Arts Council England. They made their recommendation on the grounds of its close association with our history and national life, its outstanding aesthetic importance and its outstanding significance for understanding the nature of English Renaissance architecture. The decision on the export licence application for the watercolour will be deferred until 31 May.